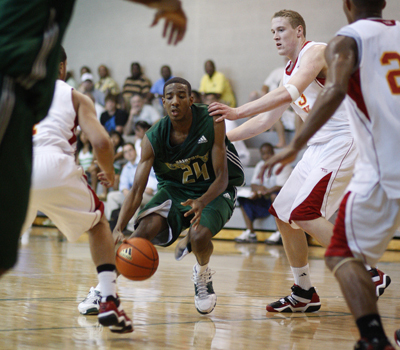 JOHN LOCHER/LAS VEGAS REVIEW-JOURNAL Austin Hollins of the Nashville Celtics drives for the net against the New England Playaz during their game in the Adidas Super 64 tournament in Las Vegas Wednesday, July 22, 2009. Austin Hollins couldn’t believe the irony when he learned the site of his first game in the adidas Super 64. Hollins and the Nashville (Tenn.) Celtics began Super Pools play Wednesday at Rancho High School, where his father, Memphis Grizzlies coach Lionel Hollins, graduated in 1971. Hollins, who will be a senior guard next season at Germantown (Tenn.) High, scored 14 points in the Celtics’ 75-52 loss to the New England Playaz. While college coaches lined the baseline eyeing potential recruits, it was the NBA coach in the stands — the elder Hollins — who had the best knowledge of Austin’s game. Rancho is vastly different from Lionel Hollins’ time there, and the main gym connected to the auxiliary gym in which Austin Hollins played is not in the same location. But the idea of playing on the campus where his father once starred — in a Celtics uniform, a similar shade of green to Rancho’s primary color — was a thrill for Austin. Lionel Hollins went on to Dixie Junior College (Utah) and Arizona State and was selected with the sixth overall pick in the 1975 NBA Draft by the Portland Trail Blazers. He played 10 seasons in the NBA, most notably in Portland, where he won a championship in 1976-77 and was named an All-Star in 1977-78. Austin Hollins said his father has provided advice during the recruiting process but hasn’t pushed any decision. The 6-foot-3-inch shooting guard with a fluid style has scholarship offers from Memphis and Arkansas and has attracted interest from Florida, Arizona State, Minnesota and Alabama-Birmingham. Though his son is rising in recruiting circles, Lionel Hollins has made sure Austin keeps his priorities in order. “He has kept a good balance, a perspective on what this is all about,” Lionel Hollins said. “It’s a means to an end. Down the same hallway in which Austin Hollins and the Celtics had their postgame meeting, Lionel Hollins found himself in a 1970 team photo among others on the wall.